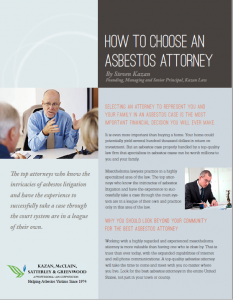 Understanding mesothelioma settlements and verdicts gives you and your family a chance to see the differences between the two outcomes. Below are reports of verdicts obtained by past and present attorneys of Kazan Law that have gone all the way through trial. It may seem strange that there are not very many, and most of them are quite old. Why do we say we are trial lawyers when we try so few cases to verdict? We accept a relatively small number of cases and prepare every one of them for trial. Over the years, defendants and their lawyers have learned that trying cases against us is rarely productive and almost always very expensive. As a result, they are anxious to settle cases with us. In fact, even when we start trial, we almost always resolve it by settlement before a verdict. Other lawyers report settlements on their web sites; we do not. Our settlements are confidential for two reasons. Our clients never want their personal financial information spread all over the Internet, and if we listed those settlements, everyone would know how much money that client received. Defendants who settle with us do not want other defense lawyers to know how much they have paid our clients. They certainly do not want other plaintiffs’ lawyers to know, because if word got out, those lawyers would try to get the kind of settlements we get. So, if we bragged about our settlements as others do, it would let people figure out which clients got how much, and it would hurt all our future clients because it would reduce the potential for getting them the kinds of settlements we have gotten others in the past. Since our primary responsibility is to do the very best we can for every client, the decision to forego bragging rights is an easy one. So, while this list might make it look as if we do not do much, it actually demonstrates how well we really do for our clients. If you have a case, we would be pleased to evaluate it for you and give you our honest and well thought-out assessment of its potential on a private and confidential basis. You can be confident that unless we go to jury verdict, no one will ever know how much we recovered for you. On April 11, 2018, a Brunswick, New Jersey awarded a historic verdict in the case of Stephen and Kendra Lanzo v. Johnson & Johnson Consumer, Inc. and Imerys Talc America, Inc.
After a three month trial, the jury found unanimously that Johnson’s Baby Powder contained asbestos during the years of Stephen Lanzo’s use from 1972 to 2003 and that both Johnson Consumer, Inc. and Imerys Talc America, Inc. had failed to adequately warn about this severe health hazard. The jury awarded punitive damages against Johnson & Johnson Consumer, Inc. in the amount of $55 million, and $25,000 million against Imerys Talc America, Inc. This compensation to Mr. and Mrs. Lanzo was in addition to another $37 million in compensation the same jury awarded for Stephen Lanzo’s asbestos mesothelioma. On November 27, 2017, an Oakland, CA jury in Oakland, CA found Vanderbilt and Imerys negligent and strictly liable for the wrongful death of Richard Booker. Mr. Booker, who died at the age of 72 from mesothelioma, worked for decades as a paint tinter and mixer making paints. Following a 6-week trial, the jury awarded $17.5 million in compensatory damages to the Booker family, 60% allocated to Vanderbilt, and 40% allocated to Imerys. Vanderbilt settled with the Booker family after the first phase of trial, and before the jury could assess punitive damages as to Vanderbilt. Two weeks later on December 11th, the jury awarded $4.6 million in punitive damages against Imerys. (Booker v. Imerys Talc America, Inc. and Vanderbilt Minerals, LLC, Case No. RG15796166, Superior Court of California, County of Alameda). Mr. Burch was diagnosed with pleural mesothelioma in May of 2016 at the age of 64. He was exposed to asbestos in the 1970s when he worked as a pipefitter handling asbestos cement (AC) pipe manufactured by CertainTeed. His work involved cutting and beveling AC pipe using various hand tools and a 12-inch abrasive disc saw, which created extremely dusty working conditions. The dust contained the cancer-causing mineral asbestos. Every day, he unknowingly breathed deadly asbestos dust at work and was never warned that the dust could cause him to contract mesothelioma. Owens-Illinois, Inc. is a former manufacturer of KAYLO asbestos-containing thermal pipe insulation. An Oakland, California jury found that Owens-Illinois acted with malice, oppression or fraud when it manufactured a defective product, failed to adequately warn consumers, and concealed the health hazards of its KAYLO products. (Rose-Marie and Martin Grigg v. Owens-Illinois, Alameda County Superior Court Case No. RG12629580).